The Wizards continue to rack up wins — even over the last 10 games, which has been the team’s most challenging stretch of the year. Last night, they did something that has me typing words that would have been difficult to imagine typing just last season: Fueled by a strong performance from Kevin Seraphin, Washington blew open a close contest late to secure a comfortable win against the San Antonio Spurs. It was the team’s first win over the Spurs since 2005. The team’s record now sits at 26-12, good for second in their division and in the conference. Their .684 winning percentage is that of a 56-win team over an 82-game schedule — rarefied air for this franchise. But…are they really that good? Basketball analytics has shown that scoring differential is a better predictor of team strength than its record. Luck can push a team’s record up or down a few wins, but how much it outscores its opponents offers a truer measure of relative strength. So far this season, Washington’s scoring differential is +2.13, a mark that would suggest a 47-win team. Add in their weak schedule (fifth easiest in the league), and their differential falls to +1.49, which would suggest a 45-win team. That +1.49 is Basketball-Reference’s Simple Rating System, a strength rating that combines scoring differential with strength of schedule. Of teams in NBA history with a similar SRS (between +1.0 and +2.0), the Wizards have the best winning percentage. They’re at .684 so far. Next closest is the 1961-62 Lakers at .675. Of the 115 teams in that similar SRS grouping, the average winning percentage is .554 — so, 45 wins. Narrow the focus to an SRS between +1.4 and +1.6, and the field is cut to 17 teams. And the winning percentage drops to .541 — about 44 wins. But, here’s where that strength of schedule thing works in Washington’s favor. 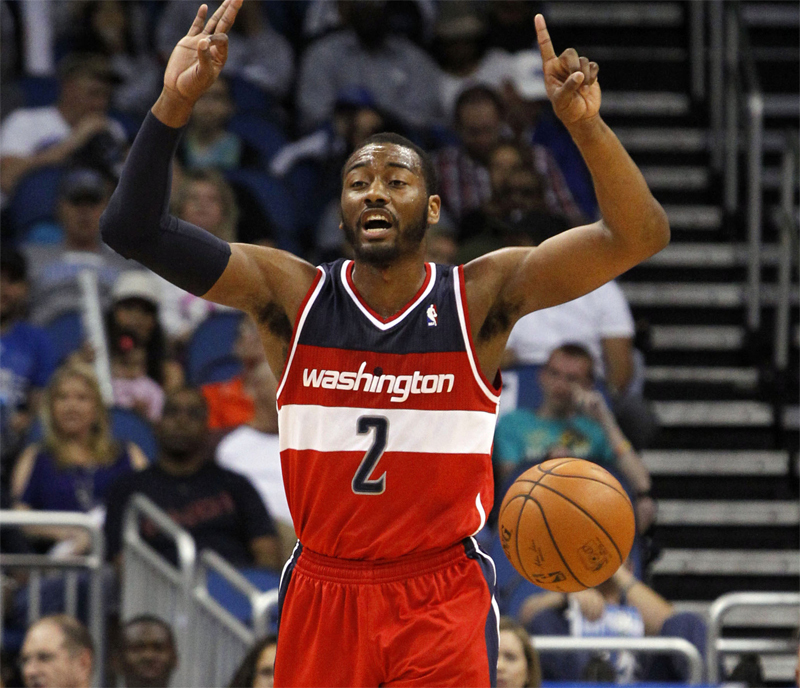 While the Wizards aren’t overwhelmingly strong, the East remains historically weak. Their schedule the rest of the way is about 0.7 points per game weaker than average — roughly the quality of a 39-win team the rest of the way. Because of that, Washington projects to finish with 51-53 wins, even without improving their scoring differential. It was fun to see Seraphin follow a good performance against the Hawks with an outstanding one against the Spurs. But, it’s going to take a sustained run of solid play from the big fella to convince me he belongs in the rotation. Previous analysis of Seraphin’s game log showed he has an above average game about 20% of the time. Over the course of an 82-game schedule, it’s almost inevitable that he’d have at least one two-game sequence where he performs above average in each. There’s approximately a 47% chance he’ll have a three-game sequence in which he performs above average. In fact, he’s already done it this season against Denver, at Boston and home against Boston from December 5-8. He followed up that three-game stretch with a meh game at Orlando, two negative games against the Clippers and Jazz, and then a replacement level performance against Minnesota. If you want a sign that he’s truly improved, wait until he’s strong together four or more consecutive above average performances. Also good: upticks in performance from Wall, Nenê, and Beal. Gortat’s performance was flat, but significantly down his production in December. There seems to be some sentiment among Wizards fans (and maybe even the coach) that the team needs a backup PG to replace or supplement Miller. While Miller is a defensive liability, his overall performance (which is what matters) has been solid. If the team is looking to upgrade for the second half of the season, it wouldn’t hurt to add a third PG for insurance. But, more pressing issues are Seraphin as the backup center, and perhaps a more athletic 3&D type to backup Beal.